A bit frail (I may look tougher but I feel frail) and a bit hard of hearing (I'm just as similar), she is still in good spirits. Prides herself that she can still drive (although it will drive us crazy thinking about it) and that she can read without glasses (here I am reading with glasses from 40). I'm so happy my mom is happy. We took her out for dinner after working hours. She was pleasantly surprised that the siamese red curry was nothing like the one she had in Bangkok ages ago. 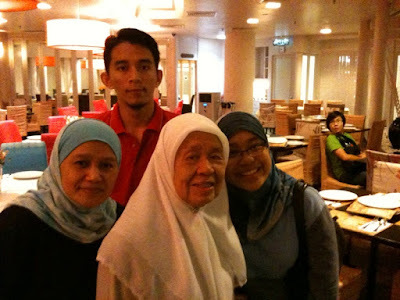 We even had a dozen restaurant staff singing the birthday song and wishing 'nenek' a happy birhday.